that’s agave: 100% organic. 100% yum. Nature’s Agave offers a variety of premium agave nectars, each with its own signature flavor and complexity: Clear, Amber, Raw, and introducing Maple Agave Syrup. 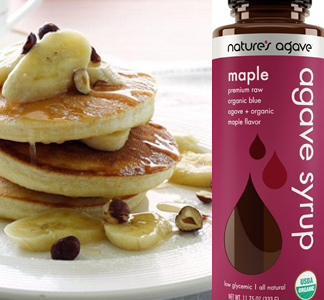 Pump up your pancakes with our delicious, low glycemic Maple Agave Syrup. Made from raw agave nectar and the essence of organic raw maple syrup, this rich, sweet syrup is delightful drizzled over waffles, plain yogurt, in baking dishes, or anything that calls for traditional maple syrup. Soap.com Online mega-store with great prices, too.